–Story progression is gated by collecting points. This requires you to collect all “trineangles” in the story chapters and do some of the class challenges to be able to continue the story progression. –A little short, 4-7 hours, depending on player experience with this type of game. –Cliff hanger ending leaves you wanting more. 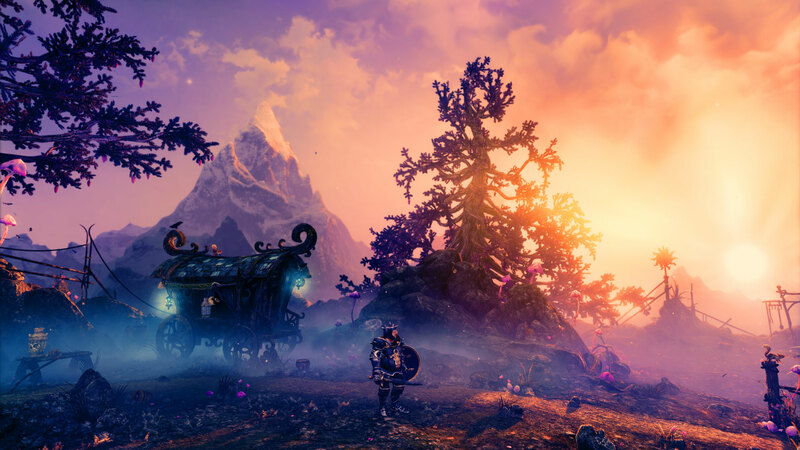 Frozenbyte is back with a new edition to the Trine series, Trine 3: Artifacts of Power for Microsoft Windows. The series tells the story of three heroes who have unique abilities and are tasked with saving the world from evil (over and over again). While the story may sound simple, its storybook charm and loveable dialogue bring each game to life. The kingdom where the games take place is a fantastical wonderland; full of saturated and breathtaking sights. In the series you can find yourself at a shimmering beach, lush jungles, magical castles, or atop snowy mountains. The playful music is evocative and magical. The environments are truly special in these games. 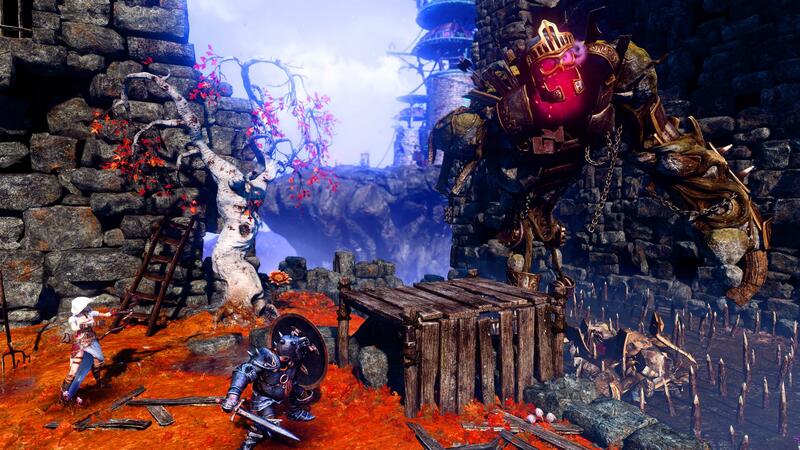 Traditionally, the Trine games have been 2D, side-scrolling, action, platform, and puzzle games, but Trine 3 differs from its predecessors with a new 3D element. There is a new depth to the levels which allows you to move toward and away from the screen, and gives you more opportunities to interact with the world. While many reviews have met this change with resistance, I found it to be refreshing with limited issues. Gauging depth is the most noticeable problem with the 3D but I only found that troublesome in “Chapter Seven: The Redwood Forest”, due to the snow already limiting visibility. Speed playing the game will make depth issues more noticeable so I recommend taking your time to enjoy what the game has to offer. Character abilities are a bit different in Trine 3. Talent trees have been removed and some of the base abilities have been replaced with new ones. At first I missed some of the advanced skills that you can obtain in Trine 2 (Monster Prison was really fun) but the new abilities work well with each other. The synergy between the new character abilities makes solving puzzles a lot more efficient and intuitive. Combat can be clunky on Zoya and Amadeus but Pontius’ new combat abilities allow you to control a large group of enemies rather easily. While most of the new skills are improvements, they are missing the flavor of the old skills. A new addition to the game is the stage select map, which mimics a game board carved out of wood. It is reminiscent of the introduction to Game of Thrones or those handmade Settlers of Catan boards. I love the design of the board, unfortunately I feel returning to the select screen between levels breaks some of the immersion that you experience in the earlier games. The board also represents the new gated story progression system which is one of the most disappointing things for me. The lack of talent trees makes collecting “trineangles” obsolete. Instead of incorporating the collection of points into a new system, the game just requires you to do it. Completionist may not complain but beginners might not realize the importance of collecting until they have to go back to previous chapters or complete class challenges to move on. Class challenges are new modes that were added in Trine 3. Each character gets their own levels, which give a little background information on them and lets you learn what each character is capable of. Class challenges force you to think about a character’s abilities and pushes you to use them to complete puzzles.These challenges seem to be more difficult and punish mistakes. One of the most interesting environments in the game is the “storybook” chapter. This level plays on the storybook theme from the previous games. The illustrated art style is an interesting detour from the highly saturated environments that are traditional to the Trine series. This chapter is an “exposition dump” though, and gives you a large portion of the story in this one level. 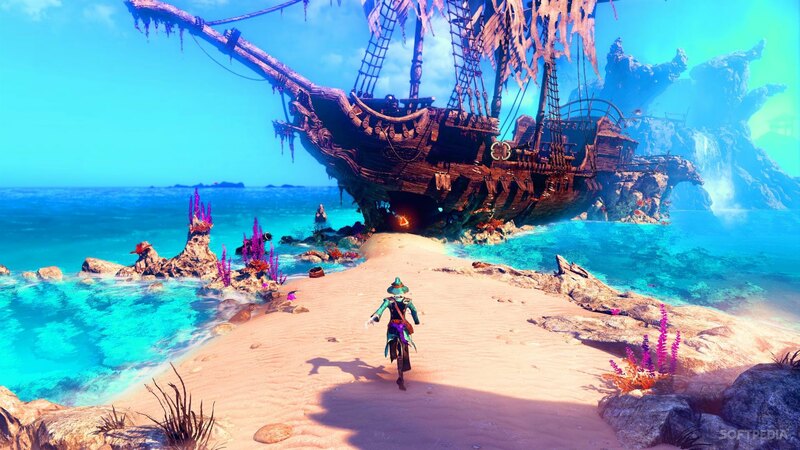 Overall, I enjoyed my time with Trine 3: The Artifacts of Power. I mostly wish the game was longer but understand the issues the developers faced. I’ve played a total of 13 hours, which included a couple hours of Early Access play, completing all achievements in single player and a few hours of co-op play. I am sure that I will return to play more co-op with other friends. For all of Trine 3’s misgivings there is no doubt in my mind that you will get your money’s worth. There is something incredibly special about these games and I highly recommend the entire series. Our review is based upon the final version of the game. For information about our ethics policy please click here. 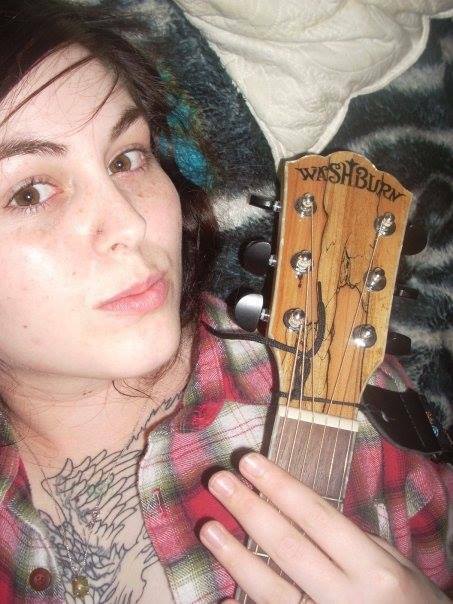 Annie is an avid gamer who takes her love for gaming to the written format with her thoughts, opinions, and discussions regarding games in their current state, but as well as the industry. With her insight to PC gaming, Annie is one step ahead of the team, and looks to keep it that way.